Scenic Tool produces connectors to overall dimensional tolerances within ±0.0005 in., stamped on high-speed presses at up to 1200 strokes/min. 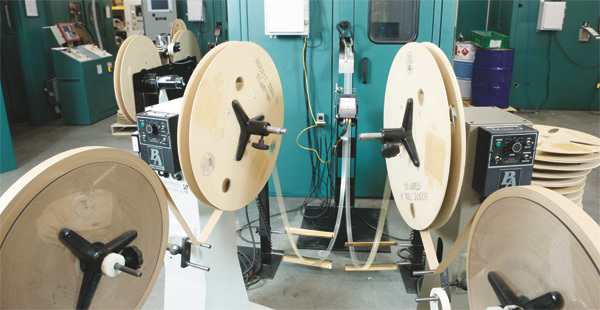 Approximately 90 percent of the shop’s electrical-connector stampings run reel to reel. Mention stamping and what typically comes to mind are high volumes of parts with required finished-size tolerances relatively simple to maintain. But what about the tiny, complex stamped parts such as electric contact connectors, measuring 0.030 by 0.150 in. and with features as small as 0.012 in. that must be stamped to overall dimensional tolerances within ±0.0005 in.? Now imagine having to manufacture the intricate tooling necessary to stamp such small components—at Scenic Tool and Stamping Inc., in Campobello, SC, it happens every day. Although the shop completes a wide range of job sizes, its expertise is in microstamping—and the tooling needed for that process. The family-owned full-service tool-and-die shop and progressive-die stamper builds and runs dies for customers. With an elevated level of precision capability, Scenic Tool specializes in providing microstamped electrical connectors for the automotive and electronics industries. In 2011, the firm produced slightly fewer than one-billion electrical-contact connector stampings for its various customers, with individual order volumes ranging from 50 to several million pieces. Most connectors are tiny and complex, and stamped from very thin material. And while also producing connectors to exacting tolerances is more than enough of a challenge, the shop’s customers continually request that they be made even smaller. As the size of many consumer products continues to shrink, the components inside them shrink as well. This means that the tooling needed to produce those stamped components has to, in turn, be smaller than ever, as well as more precise and have superior surface finishes. These are manufacturing demands that Scenic Tool overcomes using precision wire-EDM technology. With its wire EDM, the shop easily achieves surface finishes of 0.2 Ra. And, according to the company’s CNC and EDM manager Eric Blackwell, the necessary settings and parameters for doing so are built into the machine’s control, so the shop rarely goes through any trial and error processes. Additionally, the machine provides twin-head automatic wire changing, a feature that allows the shop to optimize cutting speed and economize its use of high-end small-diameter coated wire. Scenic Tool’s GF AgieCharmilles CUT 2000 wire-EDM machine achieves surface finishes of 0.2 Ra. With automatic wire-changing technology, the machine allows the firm to easily switch between wires of different sizes and materials, allowing it to optimize roughing and finishing operations while also conserving the use of high-end small-diameter coated wire. Much of the tooling components at Scenic Tool are produced for production tooling or for replacement parts for customers. The shop also designs and manufactures assembly equipment, as well as provides spare tooling. Parts, made mostly from tool steels and carbide, begin as saw-cut blocks of raw material. Machining operations can start either with manual or CNC milling, then include jig-boring or threading of holes before parts go to heattreating. Once hardened, parts are rough-ground and either finish-ground or wire-cut. The shop sometimes wire-cuts multiple parts in one setup, but most often workpieces are run one at a time because each part can require as many as 20 different cavities. With the machine programmed to move from cavity to cavity, typical burn times range from 30 min. to 5 hr. or more. With automatic wire-changing technology, the CUT 2000 lets Scenic Tool easily switch between wires of different sizes and materials, allowing it to optimize roughing and finishing operations while also conserving the use of high-end small-diameter coated wire. Eric Blackwell describes one of many applications at Scenic Tool where automatic wire changing plays a key role in reducing processing time for carbide punches. Previously the punches were cut using only 0.004-in.-dia. wire for roughing and finishing the 1.750-in.-thick parts. Eric now runs the rough pass much faster, using 0.008-in.-dia. wire. Then the machine automatically changes to the smaller-diameter wire for the finish pass. According to Eric, the CUT 2000 automatically makes wire changes in less than 2 min., and is designed to determine the exact center location of its V-guides. The operator only has to enter the desired wire diameter into the machine’s control, and the guides compensate for the difference between one wire diameter and the next. The CUT 2000 uses patented GF AgieCharmilles Universal Wire Guide technology. Two stationary three-point V-guides—an upper and lower—accommodate a range of wire diameters from 0.002 to 0.012 in. Additionally, the machine includes dynamic corner control, wire bending control (for complex geometries) and Variocut, a function that automatically optimizes machining parameters. Without its state-of-the-art EDM technology, Scenic Tool would have to produce tooling using other more time-consuming methods, say the Blackwells. The CUT 2000 allows tooling with small cavities to be processed whole to improve quality and shorten processing time. Plus, the shop can cut extremely tight inside-cavity radii with the machine’s small wire-diameter capability. 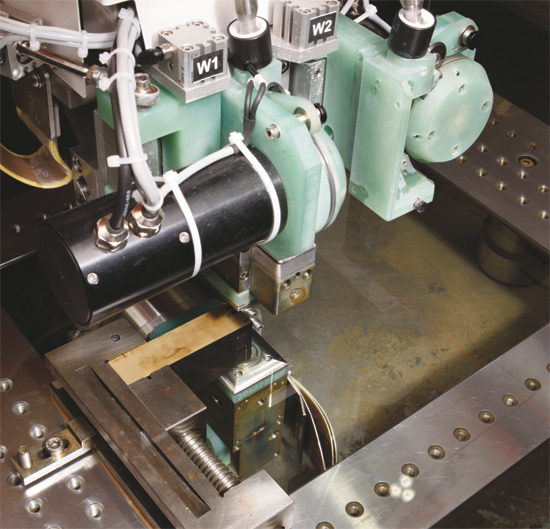 In production-stamping operations, Scenic Tool produces its connectors on high-speed stamping presses, one of which runs at 1000 to 1200 strokes/ min. 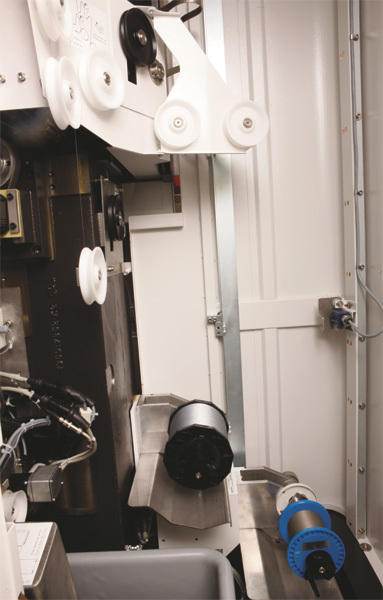 ; approximately 90 percent of the shop’s electrical-connector stampings run reel to reel. 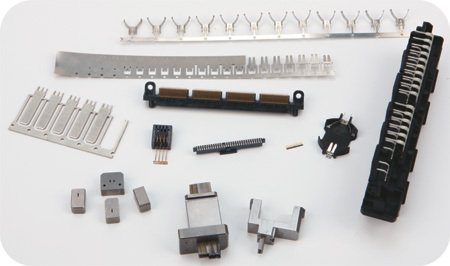 Raw material—typically copper, beryllium, stainless steel or brass—on coils move through stamping tooling, and connector parts are stamped one after another. The material exits the stamping process where it is rewound onto a reel after passing through camera inspection and quality testing. Reels then ship to customers or head out for plating. Customers run the rolled strip material into an assembly machine where stampings are cut off, and nearly all then are affixed into plastic housings to complete the connector-assembly process. Or, some stampings are cut off and layered into a plastic overmolding operation. Article provided by GF AgieCharmilles, Lincolnshire, IL: 847/913-5300; www.us.gfac.com.